The increase in global temperature across the world’s land and ocean surfaces for August 2014 was 1.35°F higher than the 20th century average of 60.1°F. Nine of the 10 warmest Augusts on record have occurred during the 21st century. Additionally, August 2014 marked the 38th consecutive August with a temperature above the 20th century average. The last below-average global temperature for August occurred in 1976. Sea surface temperatures have been higher during the past three decades than at any other time since reliable observations began in 1880. Over the past century, human activities have released large amounts of carbon dioxide and other greenhouse gases into the atmosphere. The majority of greenhouse gases come from burning fossil fuels to produce energy, although deforestation, industrial processes, and some agricultural practices also emit gases into the atmosphere. The energy is produced by power plants burning predominantly coal and natural gas, who sell the energy for heating and electricity. Commercially owned power plant are the number one emitter of carbon dioxide to the atmosphere, followed closely by the transportation sector’s burning of petroleum products (oil, gasoline, and jet fuel). Transportation accounted for over half of the net increase in total U.S. GHG emissions from 1990-2011. Carbon dioxide can stay in the atmosphere for nearly a century, so Earth will continue to warm in the coming decades. The warmer it gets, the greater the risk for more severe changes to the climate and Earth’s system. Although it’s difficult to predict the exact impacts of climate change, what’s clear is that the climate we are accustomed to is no longer a reliable guide for what to expect in the future. 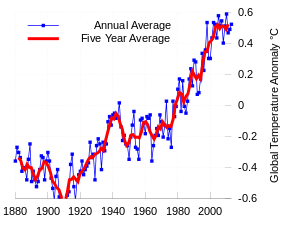 The temperature record shows the fluctuations of the temperature of the atmosphere and the oceans through various spans of time. The most detailed information exists since 1850, when methodical thermometer-based records began. The Northern Hemisphere (Arctic) sea ice extent — which is measured from passive microwave instruments onboard NOAA satellites — averaged for August 2014 was 6.22 million square km (2.40 million square miles), 1.00 million square km (390,000 square miles), or 13.85 percent, below the 1981-2010 average. This was the seventh smallest August Arctic sea ice extent on record. The second most important anthropogenic greenhouse gas (after carbon dioxide, or CO2), is methane (CH4). Although its concentration in the atmosphere is far less than that of CO2, it’s a much stronger greenhouse gas on a per-molecule basis. It also is eventually is transformed into CO2 by atmospheric chemistry processes. More than half the atmospheric CH4 load is due to human activities. 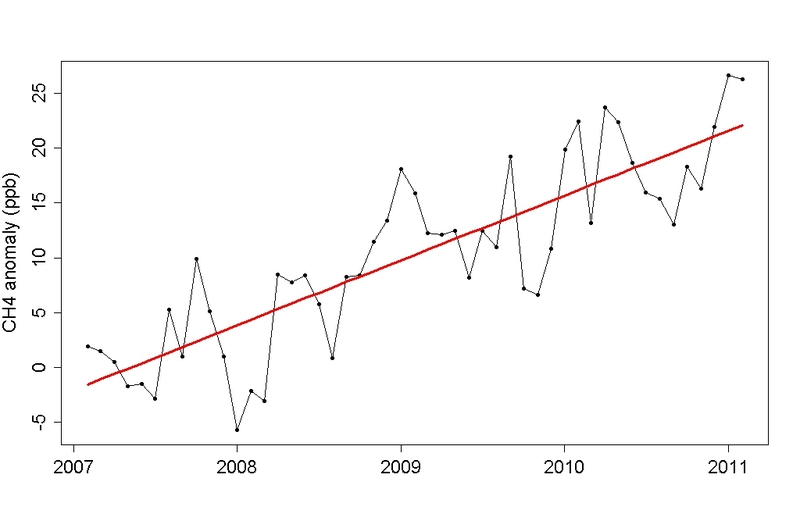 Atmospheric methane concentration had stabilized from about 1999 to 2007, but recently began rising again.